I said there was more on the book to come. 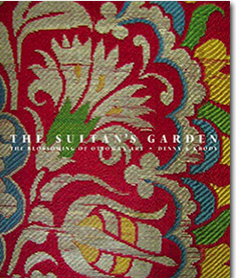 As expected, The Textile Museum's 192-page exhibition catalogue for The Sultan's Garden: The Blossoming of Ottoman Art will not only be an invaluable resource for everyone interested in stylized floral prints, enduring motifs, and Turkish design, but also an irresistible addition to the desktop. (That cover!) Bold, with a tight view of the blossoms made famous by 16th-century Ottoman court artist, Kara Memi, it's yet another eye-catcher from the D.C. institution. Makes you want to run your hands over the threads, doesn't it? Again, the show opens in September. Find background here, here and here. To pre-order the catalogue by Walter Denny and Sumru Krody, visit the museum shop. 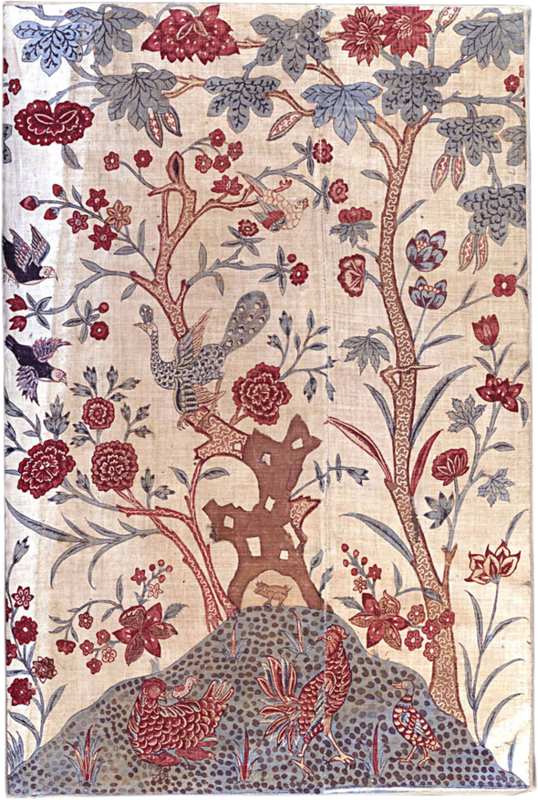 Wares crafted in Kashmir during the colonial era are characterized by all-over scrolling leaves, "paisley," and flowers including poppies and coriander. 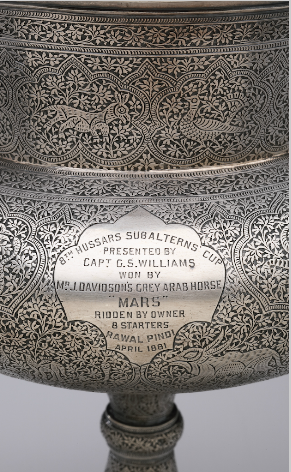 When I saw the fab, late-19th-century trophy, pictured at top, I immediately thought of densely-patterned Victorian shawls as well as a few contemporary fabrics. The silver wine carafe with stylized serpent handle, below, is profusely decorated with delicate Kashmiri blossoms and is another stunning example of what will be on view in the VMFA's upcoming show. 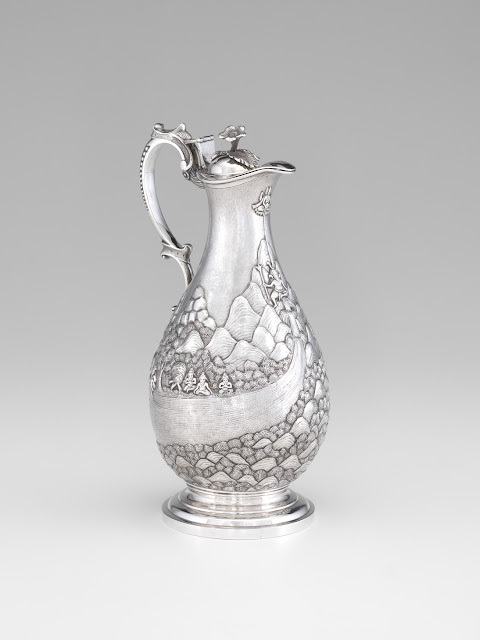 Kutch was famous for compact florals embossed in high relief and for master silversmith Oomersee Mawjee. Liberty of London chose to sell Kutch silver, so it's not surprising that wares from this region inspired Western-made copies. 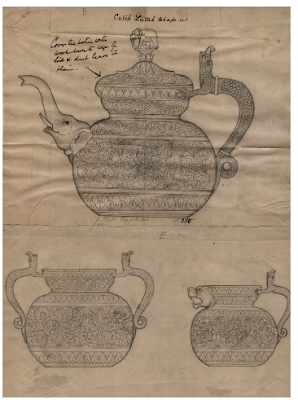 Narrative scenes were more likely to come from Calcutta -- especially depictions of rural life -- and craftsmen here may have been inspired by the work of British photographers. But, I think, the way the landscape has been interpreted on the water jug, above, like a repeating pattern, also suggests Indian textiles. More Silver for the Raj to come. Six years in the making, Sinopticon is a thought-provoking, multi-venue exhibition in the UK that looks at chinoiserie from a contemporary perspective. 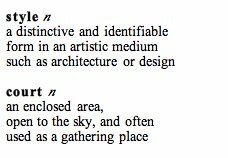 Design, desire, fantasy, politics, trade, and cultural misunderstandings: the curators' statement says they decided to delve into all of these issues. 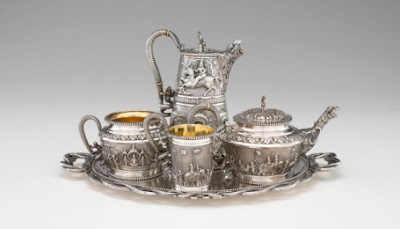 If, like me, you regularly read Emile de Bruijn's blog for the National Trust, Treasure Hunt, you already know about the project and probably wanted to take his West is East tour at Saltram yesterday. For those of us who can't get to Plymouth before the exhibition closes on July 7, the Sinopticon site provides a good intro to each of the participating artists. For example, Ed Pien. 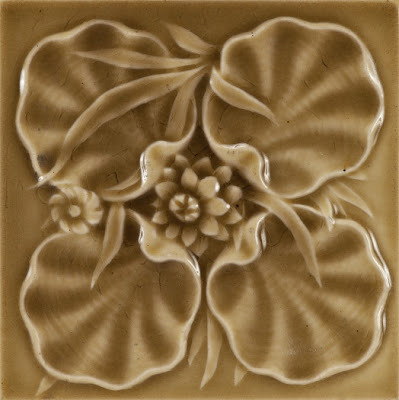 His commissions for the project include: Bloom, 2012, a monumental paper-cut piece with maritime imagery installed in Saltram's Stairway Hall and Wallpaper, 2012, a film that draws on the house's centuries-old chinoiserie papers to create a sort of living wallpaper. 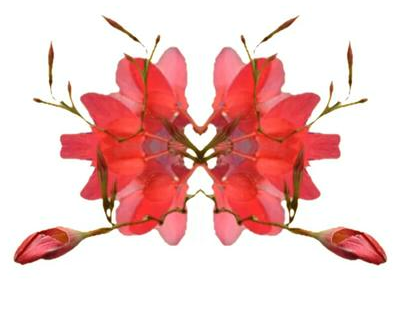 Pien shot footage of flowers -- plants he grew himself -- moving in the garden breeze, then digitally manipulated the blossoms into Rorschach-esque forms and decorative, repeating patterns. Wallpaper was commissioned for Saltram's servants' rooms. Take a peek here. 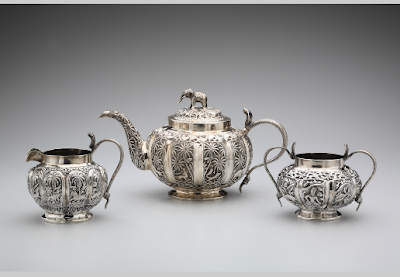 The other day I hastily mentioned the Virginia Museum of Fine Arts's soon-to-open show, Indian Silver for the Raj, but neglected to share a really great related link: Columbia University's micro-site for the 2009 exhibition, Delight in Design: Indian Silver for the Raj. 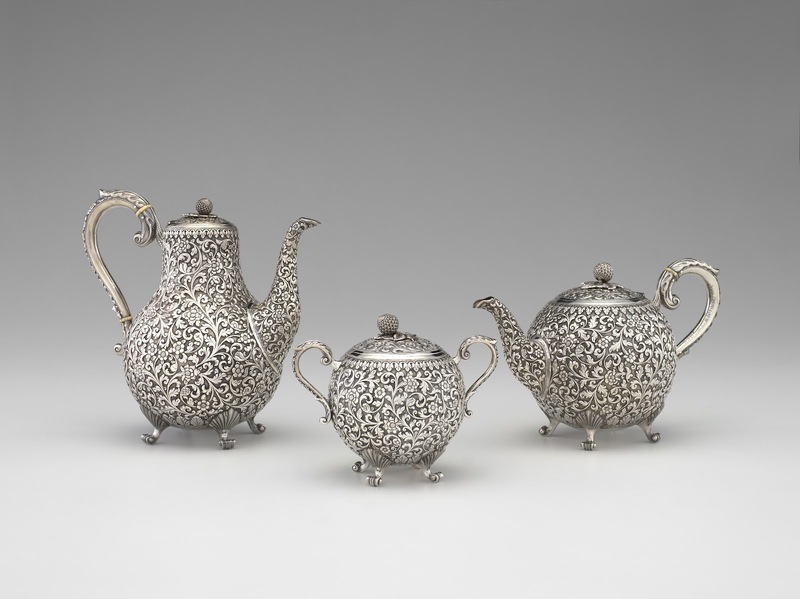 With the VMFA's recent acquisition of a large and important Colonial Indian silver collection, Richmond will now be a destination for anyone inspired by the Anglo-Indian aesthetic, even long after Maharaja closes in August. So stay tuned for a more in-depth post. 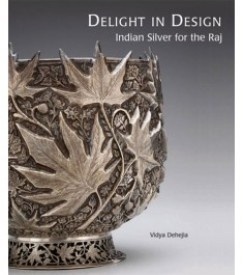 BTW, the Delight in Design catalogue is available at the VMFA gift shop. 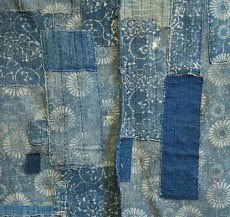 Just glimpsing a thumbnail image of Proud Mary's mud cloth Grillage pillow, I was drawn to the hand-dyed pattern's overlapping lines. When a larger picture revealed soft shades of grey, green, and rose, I liked it even more. 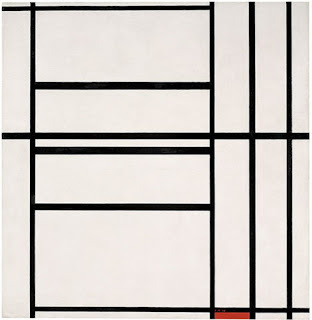 [Mondrian's Composition No. 1 with Grey and Red 1938 / Composition with Red 1939, 1938–39. The Solomon R. Guggenheim Foundation, Peggy Guggenheim Collection Venice 76.2553.39. 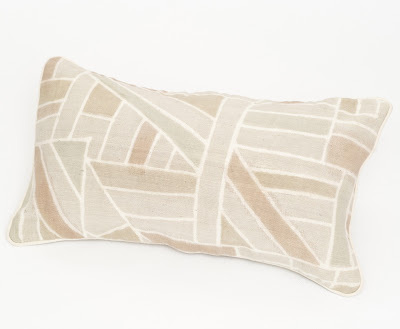 Piet Mondrian's work influenced the design, according to Proud Mary, and since the pillow was hand-made in Mali, West Africa, I'm thinking it's a nice example of art and design coming full circle. 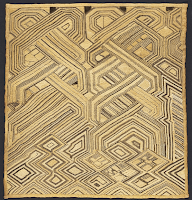 20th-century Modernists, most notably Picasso and Matisse, took inspiration from the abstracted forms seen in old Central African textiles and sculpture. And exposure to Picasso's Cubism led Mondian to Paris, where he did his own experimentation with geometry and abstraction. So the artisans in Mali are continuing one very long thread. 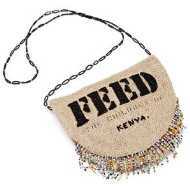 See traditional African wovens here. Downton Abbey isn't the only television series of late with gorgeous flower arrangements. Have you noticed the cut stems in Best Friends Forever? I discovered NBC's canceled comedy a little after the fact. The show first came to my attention here, then a bit later I backtracked and read Salon's review. In addition to the sitcom's smart writing, I think the pause-worthy design details are a definite bonus. Turns out, according to this interview, that BFF's creators and stars, Lennon Parham and Jessica St. Clair, presented their set design team with a binder of old domino mag tear sheets. For me, the flowers are like a supporting player. Loose, natural, and gathered in pretty containers, they're a constant presence throughout the series and create a strong sense of place (the main characters are young creatives living in Brooklyn circa 2011). If you want to take a closer look, the show is online this summer over at NBC and also available through iTunes. 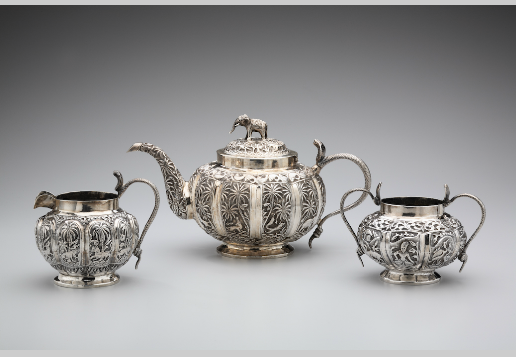 Oh, the mention of pretty containers reminds me that all sorts of striking vessels will soon be on view in Indian Silver for the Raj, opening at the VMFA on July 7. Expect to see Anglo-Indian calling card cases, colonial tea services, and rosewater sprinklers. 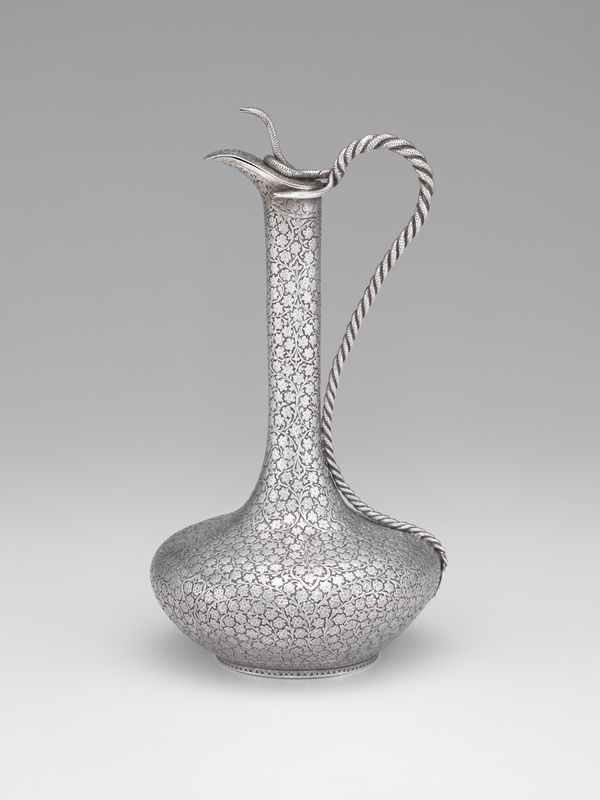 Cross-pollination is a major theme running through this exhibition: While the Raj-period forms are often distinctly English, ornamentation is Indian in style and varies according to the region in which it was crafted. The cool, crisp air of an art museum and three current exhibitions, in particular, should lure ceramics fans away from Charlotte's summer heat and into the Mint Museum Randolph: A Thriving Tradition - 75 Years of Collecting North Carolina Pottery (the largest show with over 100 pieces), The American Art Tile, 1880-1940, and The Shape of Life: Contemporary Native American Ceramics. I know that all sorts of design enthusiasts have been coming to Charlotte to see Laura Vinroot Poole's boutique Capitol, with its chic Barrie Benson interiors and jaw-droppingly beautiful vertical garden wall created by Patrick Blanc. If you're new to the region and less familiar with the Mint, it's a must for the itinerary, too, as it has such a strong focus on decorative arts, design, textiles, and fashion. 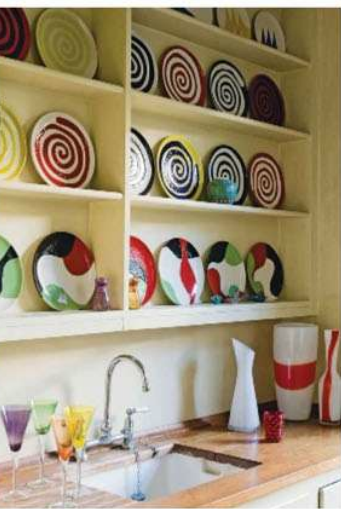 Of course, pottery is probably the most widely-known craft tradition associated with North Carolina; the Mint holds more NC wares than any other public collection in the U.S. and has also acquired a serious collection of English, Asian and Continental European ceramics as well as American Art Pottery. 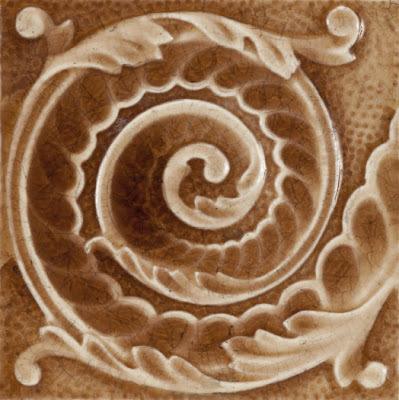 Learn about the museum's upcoming 8th Annual Potters Market Invitational here. Throughout the summer I'll be sporadically highlighting pieces from that special upcoming show, The Sultan's Garden: The Blossoming of Ottoman Art, set to open September 21 at The Textile Museum in D.C. We've already touched on the exhibition here and here, but today I wanted to add that curators have gathered together 58 works, encompassing silks, velvets, ceramics, rugs and other furnishings as well as horse adornments and costumes, to show how the Ottoman court used stylized flowers to...well, in 21st-century speak, to visually "brand" itself. 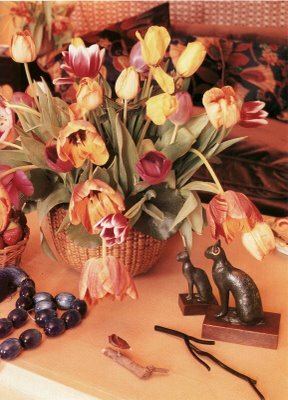 Those iconic tulips (just to name one blossom) became as recognizable as Nike's Swoosh, and still inspire new textile designs today. Shown above is a detail of an early-17th-century fragment of green-ground kemha (brocade) from Istanbul. 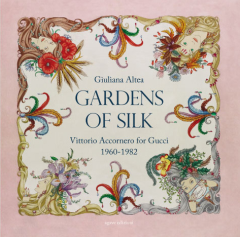 The colorful, 192-page companion catalogue should prove to be a must-have for the textile junkie's shelves. More on the book to come. Something which simultaneously conceals and reveals. That's always been the essence of lace. But more than ever, artists are looking to lace for inspiration and they're coming away re-thinking traditional lace motifs. [Cheongsam, sheet copper, saw-pierced by hand, raised and formed by Elise Benjamin. 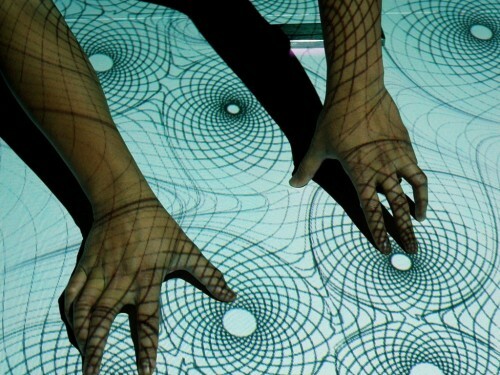 Several months ago we saw UK and other international artists pushing the boundaries of what lace can be in Lost in Lace. 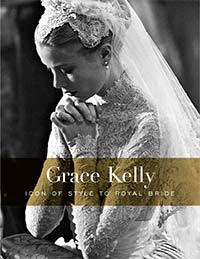 Similarly, right now down in Australia, a large Powerhouse Museum exhibition, Love Lace, explores not only textiles, fashion, and classic lace-making techniques but also sculpture, jewelery, and digital pieces. In short, all sorts of openwork structures. According to museum curator Lindie Ward, the common denominator is pattern and the interplay between solid and open spaces. 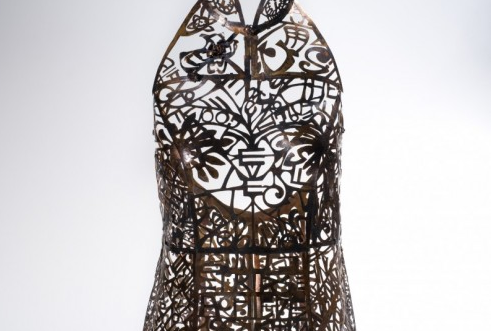 Influenced by her strict Chinese upbringing, artist Elise Benjamin re-imagined the iconic cheongsam (traditional Chinese dress) as a gorgeous but rather rigid cage of copper "lace." She literally laced it through with both English and Chinese words -- a nod to the East-West cultural push-pull she grew up with. 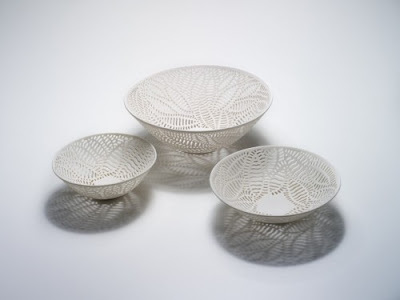 [Etched Leaf Vessels, ice porcelain thrown, pierced, etched, and polished by Sandra Black. In nature, leaves on branches often come together in a lace-like way, forming a veil against the sky, and I have spotted more than one leafy piece in the Powerhouse show. Ceramicist Sandra Black's pierced and etched porcelain bowls, for example. 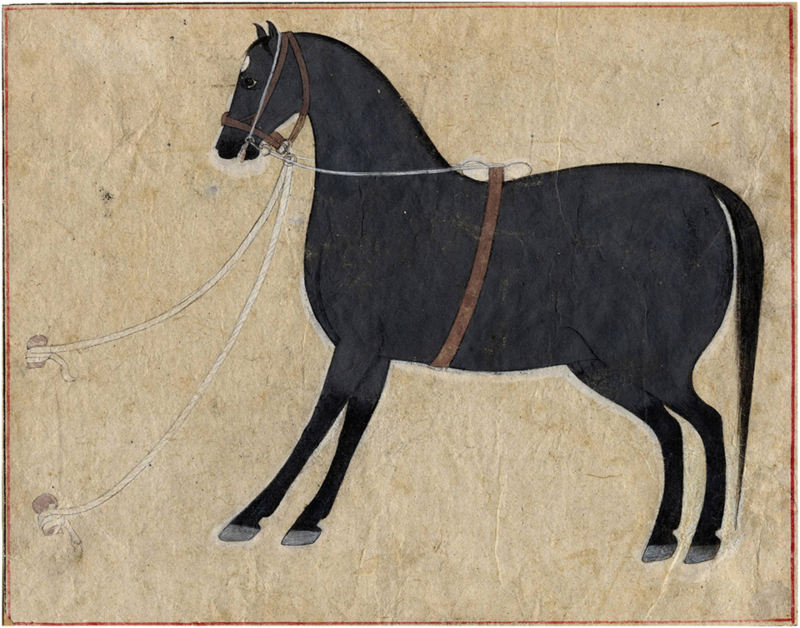 Black's focus is the passage of light and its ability to form patterns. Btw, the museum offers a wealth of info online, so it's possible to have a virtual visit. Especially via the free app, which was updated last week. (The interview with Benjamin is terrific.) 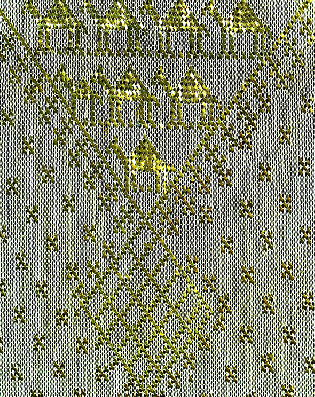 Detailed explanations of lace techniques are available here. 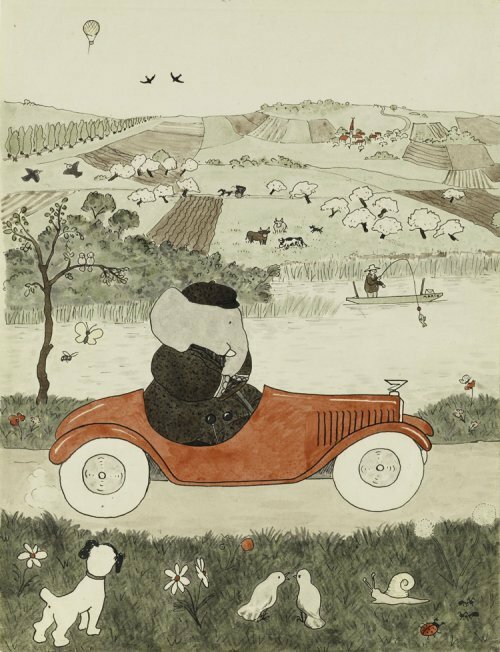 If you are planning to be in Australia in the near future, the exhibition continues through April 2013. I've decided that this printed linen/cotton from John Robshaw for Duralee functions a little like a Rorschach ink blot. When I look at the terracotta medallions, I see chandelier parts, the mehndi or "henna tattoos" of the 90s, and, if I squint just the right way, lace. But I may have been influenced by Mark Holgate's coverage of Carolina Herrera's Resort 2013 collection. 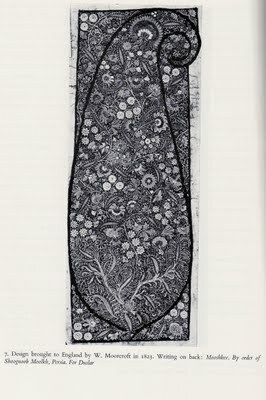 He describes a detail in one of the designer's prints: flowers arranged to look like lace. The leafy tendrils (or what I interpret to be leafy tendrils) in Robshaw's looser, painterly medallions come together in a similar lace-y way. 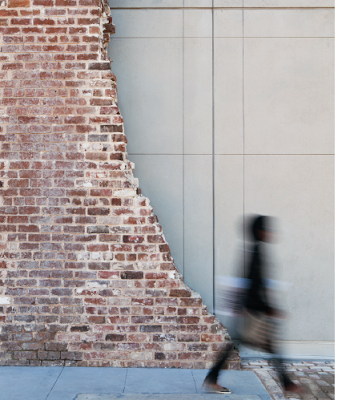 Not-so-crisp block-prints, sandblasted or aging paint that creates a sort of veil against old brick -- I'm drawn to all of it. With its massive expansion, the SCAD Museum of Art preserved original 19th-century Savannah gray brick walls handcrafted by enslaved Savannahians. As mentioned earlier, the project enabled SCAD to once again focus on adaptive reuse of neglected structures. 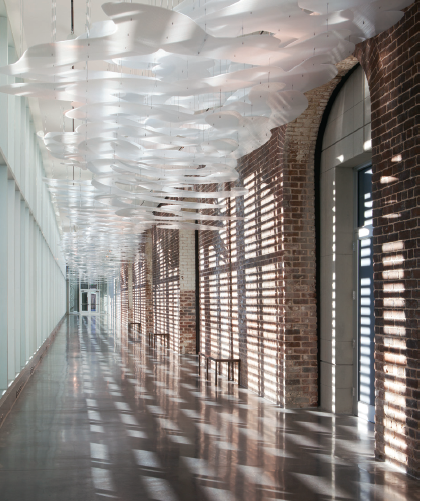 So I'm excited, not only about the new incarnation of the warehouse ruins near the historic railway complex and the contemporary architecture, but also about the potential for stellar textile-related exhibitions in Georgia. Fiber Studies are already big at SCAD (the university) and the museum's André Leon Talley Gallery is a prime venue for fashion: on view this summer through September 16 is Looking Back to the Future: Ralph Rucci Evolved. Click here for show details and here for info on the June 28 evening tour with Fashion and Accessory Design chair Carmela Spinelli. 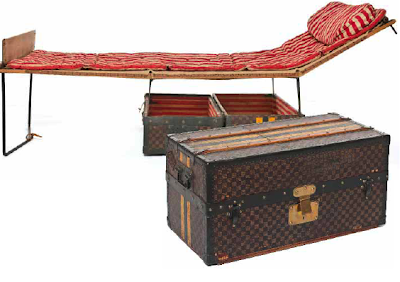 Inspiration for a little summer glamping: Louis Vuitton's 1891 bed trunk in Damier canvas from the exhibition, Louis Vuitton - Marc Jacobs, on view through September 16 at Les Arts Décoratifs. 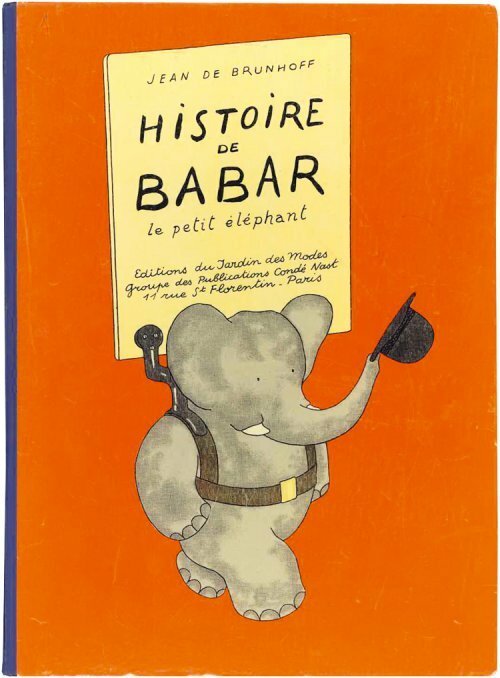 Moving from costumes and textiles to the toy gallery, Les histoires de Babar brings back memories of childhood naps. 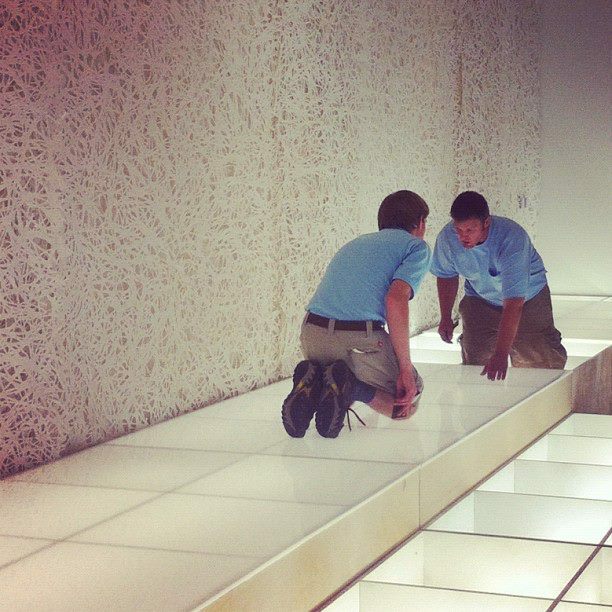 It continues at the museum through September 2. Included in this show are 100 original drawings by Jean de Brunhoff and his son Laurent de Brunhoff, which chronicle the evolution of the 80-year-old elephant, along with related toys, board games, photos and vignettes. 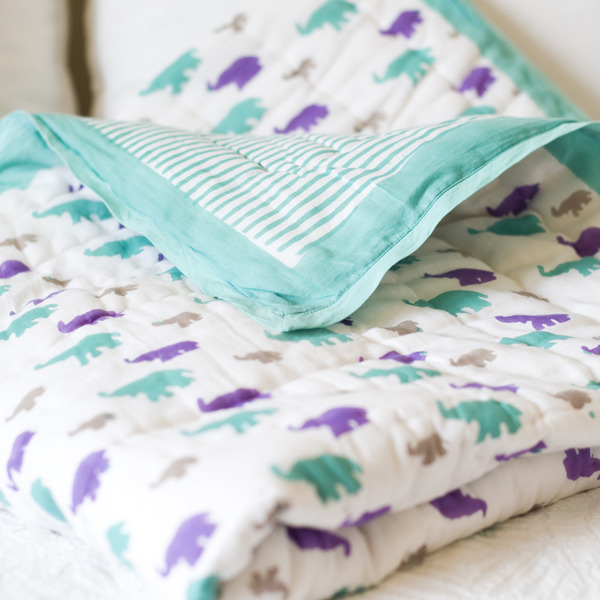 For curling up and enjoying a good story at home, Buta & Buti offers downtime accessories like this handprinted baby quilt, kids' pyjamas, bed linens, and even bed shorts for grown ups. 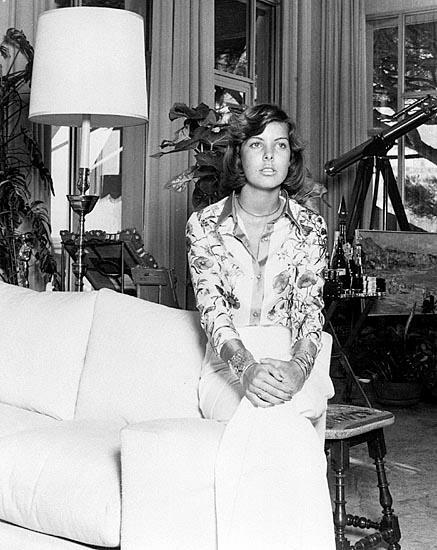 Originally appearing in 1966 on a scarf specifically designed for Princess Grace, and then reemerging on many other pieces (daughter Princess Caroline's 70s blouse, for example), Flora, Gucci's iconic print, was recently seen yet again in Vogue's coverage of the Italian house's 2013 resort collection. 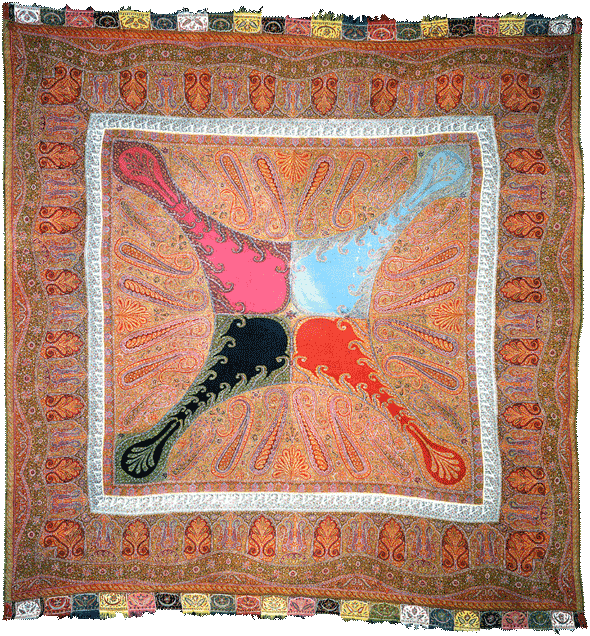 Looking at Accornero's scarves reminded me of The Printed Square, an exhibition of earlier 20th-century handkerchiefs and scarves curated by textiles authority Nicky Albrechtsen at The Fashion and Textile Museum in London. 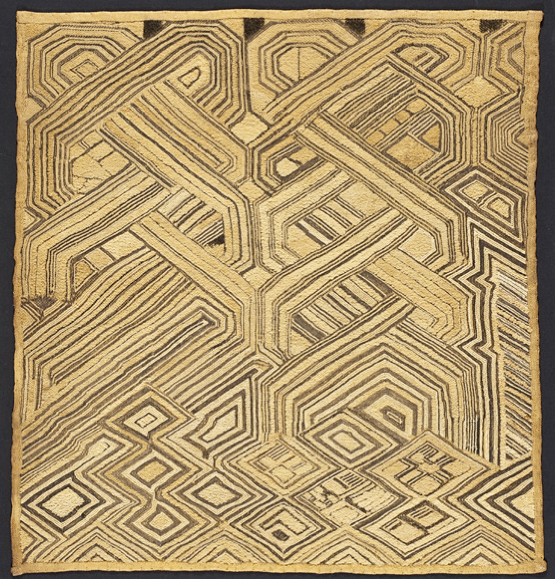 There are only a few days left to catch the show; it closes June 16 along with Designing Women: Post-War British Textiles. 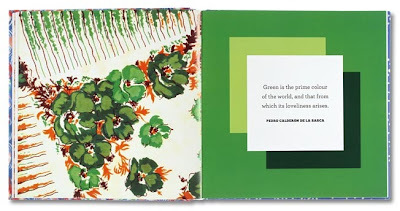 But we can all see the floral and geometric squares in Albrecht's book. 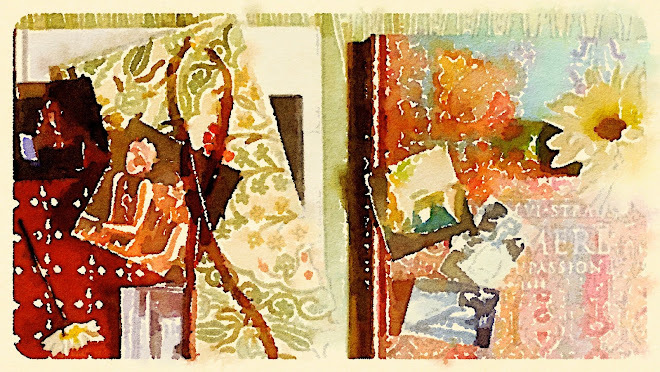 Nearly every year I sneak into a blog post a small mention of Jackie O's library pillows made from Liberty scarves. Will I finally do a similar project this summer? Probably not. I'm already swimming in paint samples for another DIY experiment. 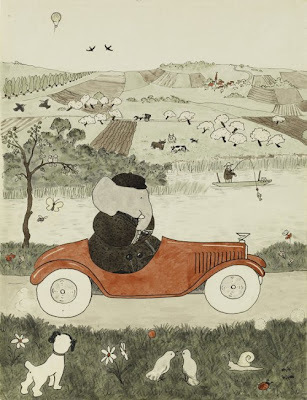 But for ongoing inspiration, I'm still drawn to Albrecht's other book, Scarves. 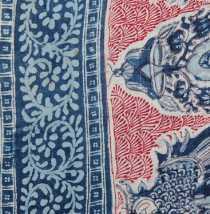 For those inclined to create their own original handpainted scarf, Sarah Campbell will lead the V & A's summer school workshop, Iconic Design: Silk Scarves on July 18. This summer, if you find yourself flying into Philadelphia International Airport and retrieving some checked bags (Terminal A-East Baggage Claim), look up and you may notice something different on the walls. Something fresh: an installation of mini-murals by young participants in the Philadelphia Museum of Art's Delphi After School Art Club. 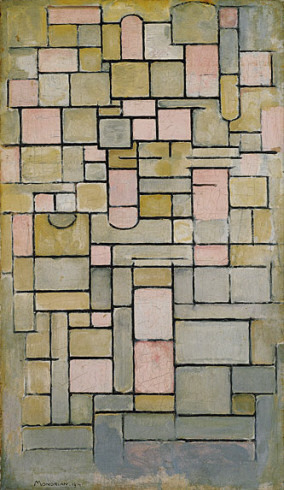 Paul Klee’s famous words, “A line is a dot that went for a walk…” served as a jumping off point for the project along with the museum's permanent collection. 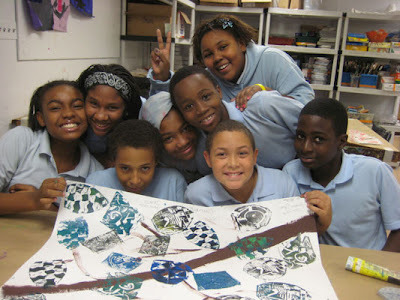 Hand-stitching, printmaking, and collage were among the techniques the middle school students used during their 19-week program. In addition to instruction from teaching artists, the kids were able to experience gallery tours and conservation science demonstrations. While we're on the PMoA, a quick reminder: Craft Spoken Here continues through August 12 and, as always, the museum has a very strong permanent textiles collection with holdings ranging from numerous Indian folk embroideries to Princess Grace's wedding dress (that's right, she donated it to the institution). Wow. 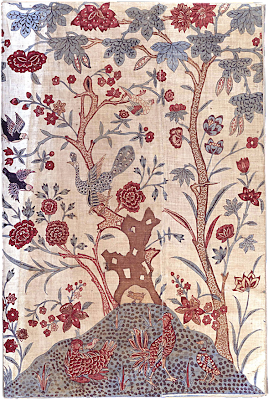 During the past few days we've seen some stunning examples of needlework. The Queen has sparkled in coats stitched with metallic thread (I love that Vogue made a connection with The Ditchley Portrait of Elizabeth I), artist Ann Carrington's embroidered red banner made its way along the Thames on Sunday, and then this morning there was the Duchess of Cambridge's lace dress. 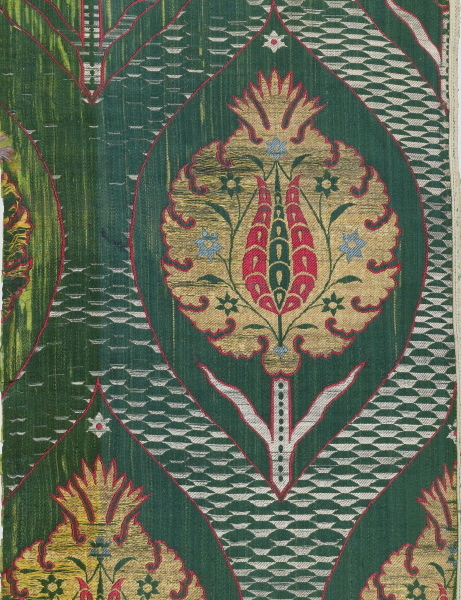 So I thought this afternoon's Textile of the Day should be intricately worked with a bit of shimmer. This example is from a Lacis Museum exhibition, The Asuit Cloth, previously mentioned on my Tumblr page. According to the museum, most scholars believe the textile originated in Egypt, where it is described as "net of metal," and it is in fact made by incorporating thin metal strips into tulle. In the Roaring 20s, when all things Egyptian were in fashion in the West, Asuit shawls had their moment in the sun. Learn more about the show, as well as summer needlework classes offered at the San Francisco center, here. It's the summer of London. 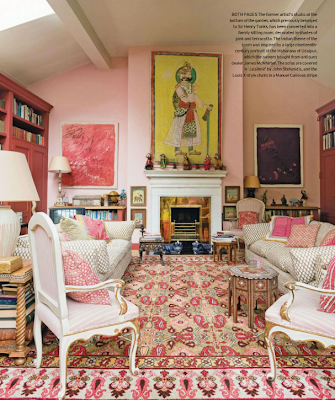 I wanted to revisit that Chelsea painter's studio-turned-sitting room (an Indian-influenced, pink sitting room positioned in an English garden, to be specific) created by artist and jewelry maker Charlotte di Carcaci. 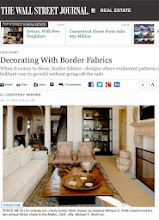 In April, after I mentioned the studio, Charlotte told me that her wall color, Sanderson's pink allure, is her pick for top ready-mixed paint and also a favorite of her good friend, textile designer Lisa Fine. "I had heard of Charlotte's pink walls long before we even met. I think subconsciously I was very influenced by the 'famous pink studio' on Cheyne Road. 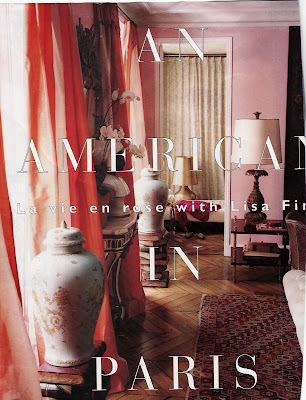 I thank her for sharing the color... it is my favorite pink outside of India," Lisa replied when I asked about the paint, pictured below on the walls of her Paris apartment. As it happens, on the other side of the Atlantic in Virginia, the summer of the Maharaja is well underway, too. Naturally I was curious about the friends' mutual passion for Indian arts, and how their tastes are similar but divergent. Happily, they took time to share some more. 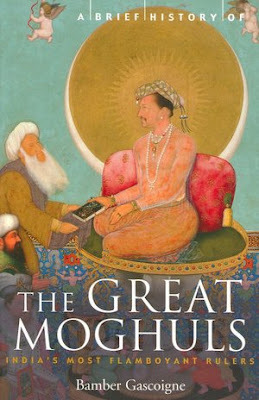 Charlotte explained, "I have been passionate about India since I read Bamber Gascoigne's book The Great Moghuls as a teenager, and Indian miniatures have always been a great love. 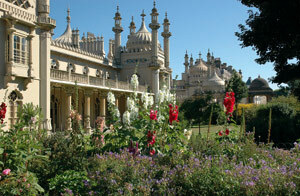 When I was very small, I wanted to live in a house that looked like the Royal Pavilion at Brighton without realizing its Indian influence. But I didn't actually go to India until I spent my honeymoon there. Since then, I have returned many times. Lisa has travelled there more frequently and extensively, and we plan to go there together next year." Lisa said, "We often shop together when I am in London and when I am not with Charlotte I send her images from my phone." And Charlotte added, "[Lisa] sent me some images of 19th-century colored-glass chandeliers from a palace in Lucknow that have inspired the palette of our next collection of rings for my jewelery company Legge and Braine. 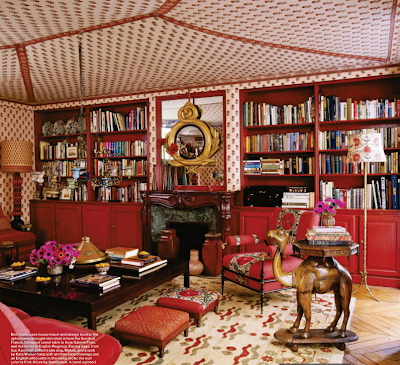 Both Lisa and I love a mix of ethnic and European pieces in a room and an element of fantasy and romance. 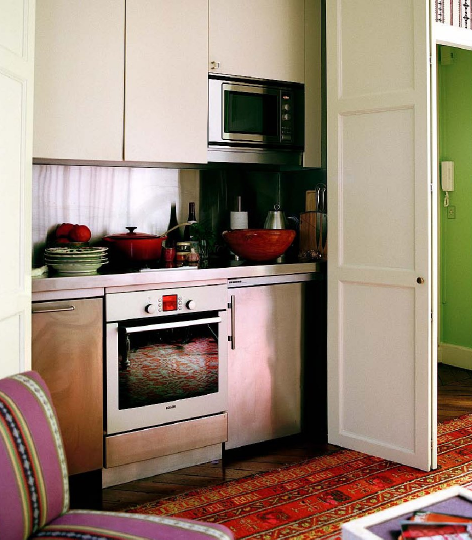 We love similar colors, although Lisa is more keen on using aubergine as a decorating color than I am. She is one of the few people I know whose taste I completely trust whether it is in decorating, jewelery, food, or people. I love reading from her vast and extremely scholarly reference library of textile and design books. 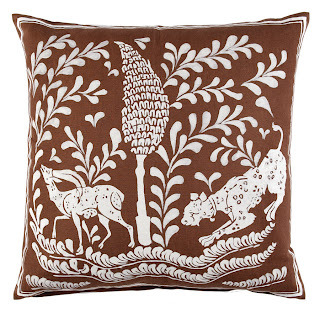 Lisa is much more forthright as a person and her decorative schemes have more cohesion. 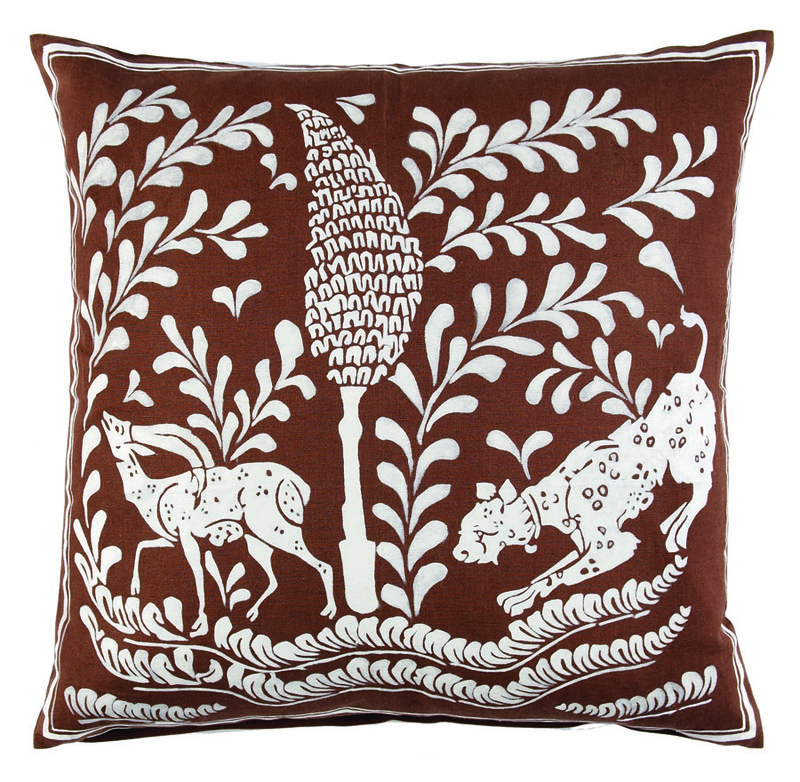 Her love of animals transmutes itself into textiles that incorporate animals and birds which I wouldn't necessarily use myself. 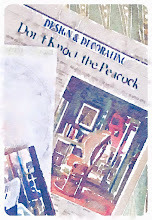 I am a lot more haphazard in my decorating but we are both people who know what we like immediately." 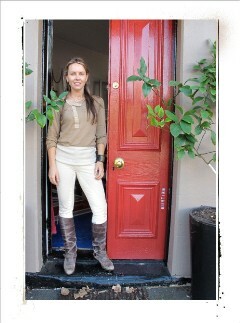 Describing favorite haunts, Lisa said, "We share a love of many things. 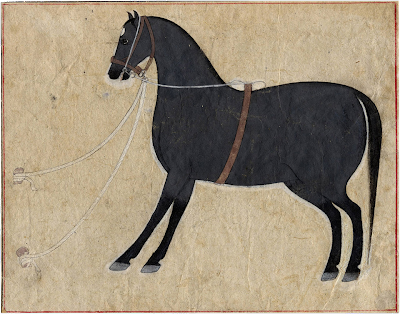 I love going to Simon Ray in London and looking at the Persian and Indian miniatures with Charlotte or to Joss Graham for the antique textiles. Charlotte has a true knowledge and appreciation for rare objects and antiquities and I always learn so much from her. Yes, we do have differences. Charlotte is very English and I am very American. I will always go for a slick new kitchen or bathroom. Sometimes I fall victim to fashion as much as I may regret those decisions later. Charlotte never falls victim to trends. Occasionally, she can go a little eccentric but it is never obvious, predictable or tacky...interestingly, despite her very refined and innate taste and elegance, she has an uncanny sense of what is commercial. 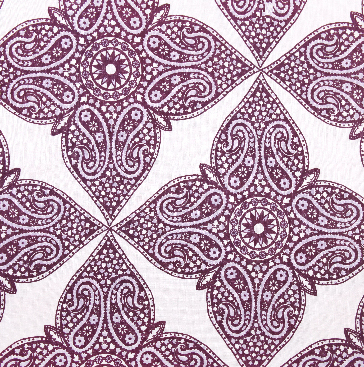 Often the textile designs and the Irving & Fine tunics Charlotte chooses are our best sellers." [Charlotte's kitchen photographed by Andreas von Einsiedel, House & Garden, UK, May 2012. Many design junkies have admired Lisa's Paris digs in Lonny, The New York Times, and Elle Decor but Charlotte has enjoyed time there as a guest. She said, "Lisa introduced to me the pleasures of shopping in Paris. 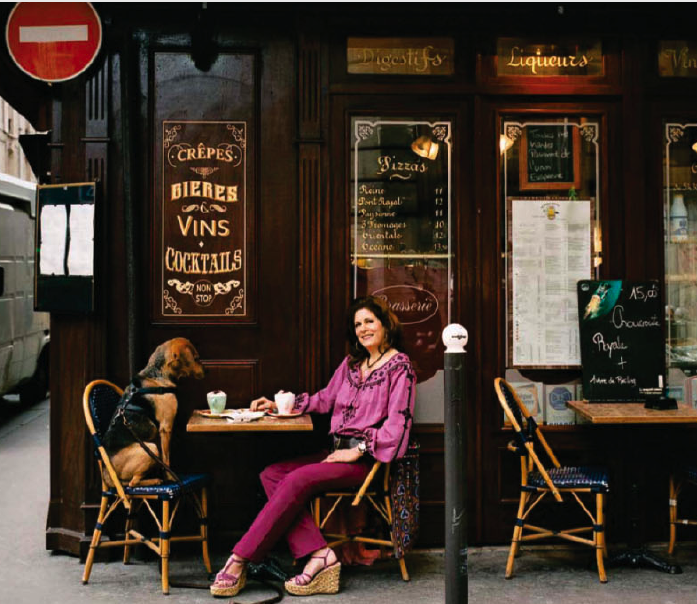 Staying with her there, and exploring the rue Jacob and the flea market and restaurants is one of my favourite things to do in the world." BTW: The VMFA will host the first Samosa Saturday on June 9. During the event curators will share highlights of the Maharaja exhibition while Indian tea and pastries are served.